Musician's Workshop - PreSonus Erise Studio Mon 2x 5.25"
A step up in size and power is the Eris E5, which takes up just 7 x 10.24 x 7.68 inches (178 x 260 x 195 mm). The E5 sports a 5.25-inch, Kevlar low-frequency driver, mated with a 45W, Class AB amplifier; and a 1-inch (25 mm), silk-dome tweeter powered by a 35W, Class AB amplifier. It can crank out a clean 102 dB SPL, peak. Frequency response is rated at 53 Hz to 22 kHz. 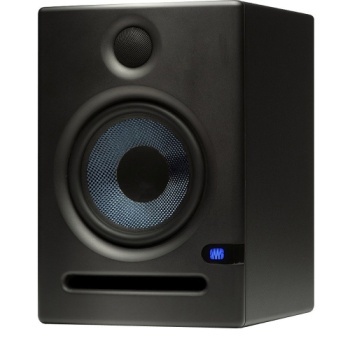 For a studio monitor in its size and price class, that’s impressive.